Personally, I think of scented nail varnish as a bit of a gimmick. I mean, yes it's a cute idea and I can see the appeal, but realistically I'm happy using plain, ol' polishes if I'm a fan of the formula and the shades. 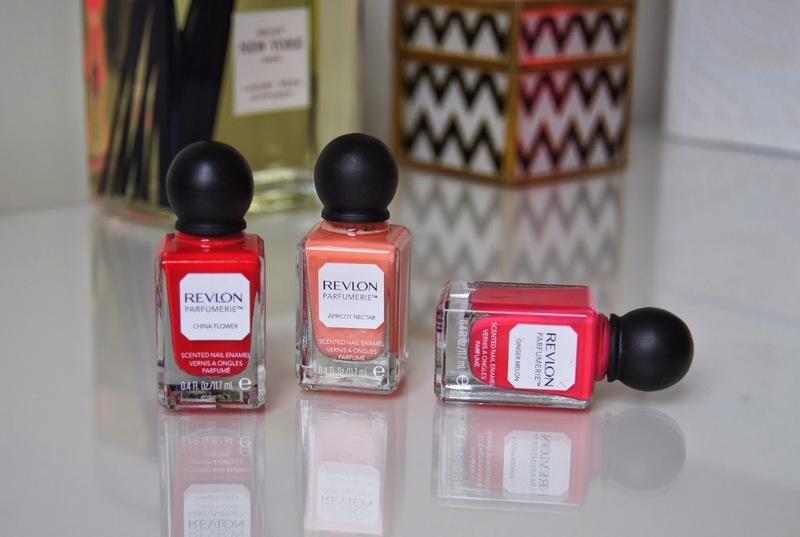 So, I was intrigued to see if the Revlon Parfumerie Scented Nail Enamels would convince me otherwise. When they were first released last year, I seemed to swerve their arrival and didn't pick any up. 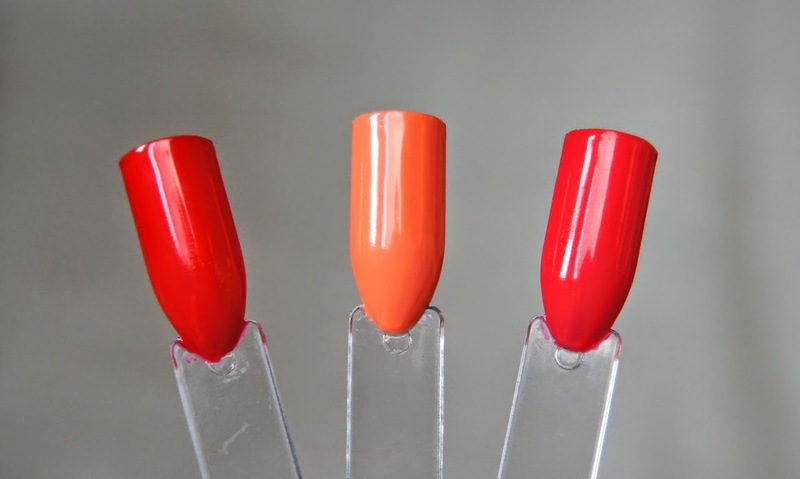 Recently, whilst on the hunt for some new shades ready for Spring/Summer, they finally caught my eye and I added a trio to my collection; China Flower, Apricot Nectar and Ginger Melon. There's twenty shades in the Parfumerie line, offering plain, shimmer and glittery finishes, so there's something for everyone's taste. Reminiscent of old, perfume decanters, the cute, cubed bottles look much classier than others from drugstore brands. Split into three categories, Sweets & Spices, Freshes and Fruit and Florals, each shade has it's own, individual scent, which matches the name of the shade pretty well. Don't make the mistake of giving these polishes a good sniff when they're wet, as the scent only becomes apparent once dry. Expecting only a faint, subtle fragrance, I was pleasantly surprised by how strong the fragrance actually is when I first tried the formula. But, after you've finished your nail painting session, you have to have your talons very close to your face to notice the scent and it does eventually disappear after a couple of days. All three of the enamels I picked up have quite a sheer, gel-creme formula, although it seems that the lighter shades are much more wishy-washy than the darker. To get a perfectly opaque, non-streaky finish, I find that I need at least two coats. Although, the polish dries impressively quickly, so you don't need to wait too long before applying another layer. By prepping with a base coat, the wear-time is good, with only slight fading at tip edge and minor chipping after three days or so. To maximize the longevity, sealing the colour with a top coat is the best idea, but then the perfume element is masked, which defeats the whole object of using them. Apricot Nectar is a soft, pastel, peach shade which screams Spring and has a mouth-watering, sweet, apricot jam scent to it. This is the sheerest of the three I picked up, needing three coats for a perfected finish and it has more of a creme finish to it than the other shades. Ginger Melon is a bright, coral pink which will look amazing against bronzed skin, in the warmer months. Having a sour, fruity fragrance to it, it's zingy and is by far the most powerful, sometimes headache-inducing, scent out of the three I chose. Compared to Apricot Nectar, the pigment is a lot stronger with this shade and it only needs two coats, but it has a more of a translucent, gel consistency. China Flower is a bold red that has a raspberry undertone to it and an exotic, musky, floral scent. Again, this shade has a glassy, gel-like finish, but it provides the most solid, dense coverage. Although I'd probably double up the coats, you could get away with applying just one. Priced at £6.49 each, these Revlon nail enamels are rather expensive compared to the likes of Rimmel, Maybelline and Loreal and I don't think they're necessarily worth it. Yes, they're decent, but Model's Own have a range of scented varnishes and their formula is better and they're £1.50 cheaper. I'd probably only buy more of these polishes if I saw them on offer, put it that way. 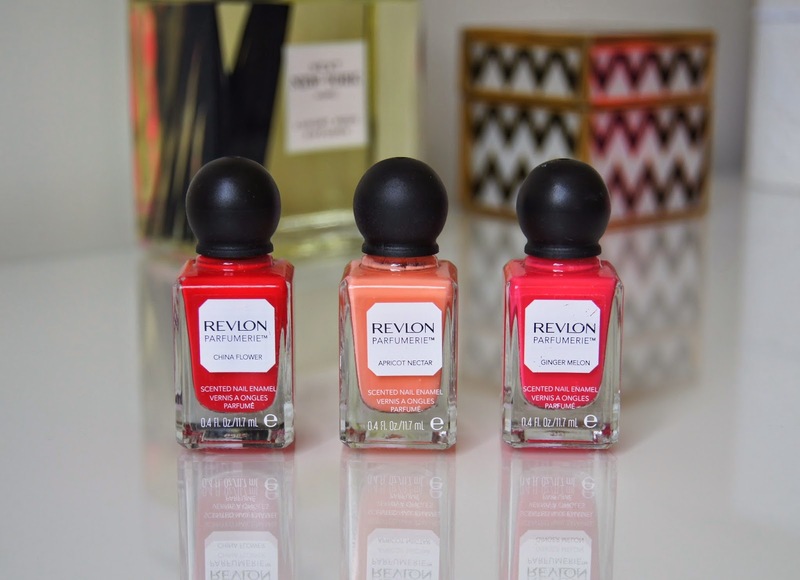 Have you tried the Revlon Parfumerie Nail Enamels? What do you think of them? I’ve been really intrigued by these polishes since they were released and I am a fan of gimmicks ;) Apricot Nectar looks amazing and I love the sound of the scent. They are definitely more expensive I don’t pay that much when I buy my OPI online haha. I'd been really tempted to buy a couple of these, but I know they'd just be a fad for me. Ginger Melon is a gorgeous shade though!